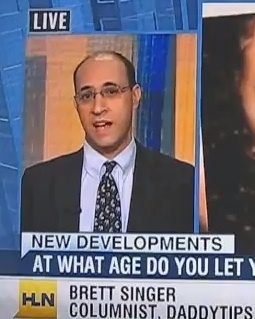 Brett Singer of DaddyTips.com was on CNN HLN on 5-4-12 to discuss how parents can talk to their kids about social media. Watch the video here. If you want to skip to the part where Brett starts talking, click here. Brett Singer of DaddyTips.com was on CNN HLN on 4-27-12 discussing a different angle of the Stuart Chaifetz story. Watch the video here. Brett Singer of DaddyTips.com was on CNN HLN on 4-25-12 discussing the story about Stuart Chaifetz and his son, an autistic boy who was being verbally abused by his teachers. Watch the video here.